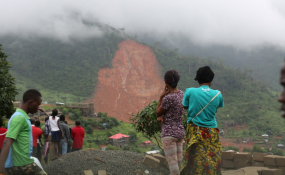 How Can Sierra Leone Learn From Fatal Mudslides? Sierra Leone Mudslide - What, Where and When? In Sierra Leone, mudslides have engulfed a whole community and Unicef is helping families affected. More than 400 people were killed, and 600 people are missing. Dakar — "The chance of finding more survivors is slim to none"
When aid worker Idalia Amaya arrived at the scene of the mudslide that devastated Sierra Leone's capital Freetown, she was horrified to find homes washed away, entire villages engulfed by mud, and corpses floating down the streets. "Bodies were just being washed down streams ... so many people were crying and wailing," said Amaya, an emergency response coordinator for Catholic Relief Services (CRS). "It was a horrible sight - it was devastating," the U.S. aid worker told the Thomson Reuters Foundation by phone on Wednesday, two days after witnessing the mud's deadly fallout. A mountainside collapsed on Monday morning in the town of Regent, burying dozens of homes as people slept and killing at least 400. Women and children were hit the hardest in what is one of Africa's deadliest mudslides in decades. Rescue workers have uncovered about 400 bodies so far, but that number is likely to surpass 500 as the search persists, Freetown's chief coroner Seneh Dumbuya said on Tuesday. "The chance of finding more survivors is slim to none," Amaya said. "It is so difficult to search in the mud." "A lot of victims were women and children, as men had left for work early in the morning. It is heartbreaking to see fathers and husbands who have lost all of their relatives." At least 3,000 people have been left homeless - and urgently need food, shelter and healthcare - while another 600 are missing, according to the Red Cross. "Many people are reliving trauma they suffered during Ebola," said Amaya, referring to the world's worst recorded outbreak of the disease, which ravaged the former British colony from 2014 to 2016, infecting 14,000 people and killing 4,000. "They are working around the clock to dig out survivors, support those in need, and make the best of the situation," Amaya added. "I am struck by the resilience of people who have been through civil war, Ebola and deadly floods." Bodies continue to arrive at Freetown's overwhelmed central morgue, with corpses laid on the floor and the ground outside. The authorities and aid agencies are preparing to bury the dead in several Freetown cemeteries in coming days, CRS said. As hundreds of people queued outside the morgue, Amaya said Freetown was struggling to come to terms with its latest disaster. "It still feels very raw," she said. "But people are coming together, grieving together, and starting the healing process."